We’d love your help. Let us know what’s wrong with this preview of Amelia Lost by Candace Fleming. In alternating chapters, Fleming deftly moves readers back and forth between Amelia's life (from childhood up until her last flight) and the exhaustive search for her and her mi From the acclaimed author of The Great and Only Barnum—as well as The Lincolns, Our Eleanor, and Ben Franklin's Almanac—comes the thrilling story of America's most celebrated flyer, Amelia Earhart. To ask other readers questions about Amelia Lost, please sign up. Is it informational adout her career? The book is heart-thumpingly exciting in places, and I liked reading about several teenage amateur radio buffs who caught Earhart's final signals (or did they? would have loved more inclusion about how these kids came to light and what was/wasn't done to authenticate their accounts; it's made clear that the stories aren't authenticated). The best parts are those about the final flight and about her childhood. I LOVED this book with all my heart! Hands down, one of the best books published for kids in 2011. This biography of Amelia Earhart intersperses the details of her life with the details of her disappearance. The writing is excellent. From the very first page I was hooked and emotionally engrossed. I became worried about Amelia's lack of communication during her last flight and I tore through this book searching for answers. There are many pictures and copies of artifacts (letters etc) and the ch I LOVED this book with all my heart! Hands down, one of the best books published for kids in 2011. This biography of Amelia Earhart intersperses the details of her life with the details of her disappearance. The writing is excellent. From the very first page I was hooked and emotionally engrossed. I became worried about Amelia's lack of communication during her last flight and I tore through this book searching for answers. There are many pictures and copies of artifacts (letters etc) and the chapters are short and packed full of information. I learned things that other bios about Amelia hadn't covered such as how carefully her public image was crafted, especially with help from her husband, publisher George Putnam. This idea made me look at Amelia in a different light, but there is still much to adore about this heroine. The author does a good job of reserving judgment about her subject and just presenting the facts for the readers to judge themselves. I love learning something I didn't know, and in this bio I found out that Amelia was the Lady Gaga of her time in terms of self-promotion. I had no idea how carefully she crafted her image, down to curling her straight hair, which she let the public believe was naturally tousled and windblown. I was left with two questions at the end, tho, which were did she ever meet Charles Lindbergh and how DOES one go to the bathroom on those long plane rides? Also at Reading Rants: http://www.readingrants.o I love learning something I didn't know, and in this bio I found out that Amelia was the Lady Gaga of her time in terms of self-promotion. I had no idea how carefully she crafted her image, down to curling her straight hair, which she let the public believe was naturally tousled and windblown. I was left with two questions at the end, tho, which were did she ever meet Charles Lindbergh and how DOES one go to the bathroom on those long plane rides? Amelia Lost by Candace Fleming tackles a topic that has always interested me: what happened to Amelia Earhart? 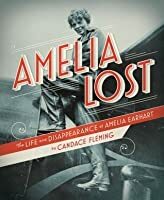 As the subtitle - The Life and Disappearance of Amelia Earhart - foretells, Fleming brilliantly moves back and forth between Amelia's life and the involved search for her and her missing plane. Fleming starts with a preface about the difficulty of separating facts from fiction concerning Amelia Earhart. Fleming emphasizes the point that Earhart represented the many opportunities becomin Amelia Lost by Candace Fleming tackles a topic that has always interested me: what happened to Amelia Earhart? As the subtitle - The Life and Disappearance of Amelia Earhart - foretells, Fleming brilliantly moves back and forth between Amelia's life and the involved search for her and her missing plane. Fleming starts with a preface about the difficulty of separating facts from fiction concerning Amelia Earhart. Fleming emphasizes the point that Earhart represented the many opportunities becoming available for women. Fleming dives into the disappearance of the Amelia's plane on July 2, 1937. Fleming then alternates chapters on Amelia's life, starting with her childhood up until her last flight, and the disappearance of Amelia herself. Among the details about Amelia's early life that I found particularly interesting: Amelia lived with her grandmother Otis in Atchison during the school year as a young child while her parents lived in Kansas City. Amelia nearly perished while sledding, but survived because she rode a sled lying down like a boy. After moving to Des Moines, her father began to drink and became an alcoholic, losing his well paying job. Amelia worked as a volunteer nurse's aide in Toronto for a year caring for World War I wounded. Fleming shows that Earhart was not the best pilot, givng comments by other female pilots and a 3rd place finsish in a race, but Amelia did have lots of courage and preseverance. Fleming effectively makes the point that George Putnam helped keep Amelia's name in the news allowing her to lecture and earn money to pay for her expensive flights. The fact that Earhart became romanticly involved with Putnam while he was married is made clear. Among the most damning of the details about the final flight was the fact that Amelia took only one hour to learn how to operate the new radio and learned only some basic information. Having only one crewmember on the flight, and that a man known to be a heavy drinker, was another questionable decision. An amazing fact was that an airfield was built on Howland Island by taxpayer money just for Amelia's round the world flight attempt. Among the many interesting facts about the search are the various messages supposedly from Amelia heard by civilians. Gardner Island, often suspected of being the spot where the plane crashed, was briefly looked at early on but was dismissed as not having anyone visible during a brief air flyover. Amelia Lost is an excellent biography but also a wonderful historical look at the early history of women in aviation. The weaving of Amelia's life and her disappearnce is skillfully done in a way to appeal to readers from middle grade and up. Including some of the theories about the disappearance might have useful and intersting for readers. This well researched volume concludes with source notes and a detailed biography including web sources. Two of the web sources I found particularly interesting were the TIGHAR site and Purdue University's Earhart archive site. This is more than a dry “here’s the life of Amelia Earhart” story. If you want to know what she was like, what she was really like, you’ll find it here. She was a girl with a dream and penchant for adventure. And while she and her husband were brilliant publicists, it turns out she wasn’t very good at planning. It starts out telling how a ship was waiting to direct Amelia to the island where they built a short runway and a place for her to refuel before the last leg of her trip around the world. This is more than a dry “here’s the life of Amelia Earhart” story. If you want to know what she was like, what she was really like, you’ll find it here. She was a girl with a dream and penchant for adventure. And while she and her husband were brilliant publicists, it turns out she wasn’t very good at planning. Then we are taken back to Amelia’s childhood, where she tried explaining her love of airplanes, and “of liking all kinds of sports and games and not being afraid to try those that, back then, were looked upon as being only for boys.” She said there was something inside her that always liked to try new things. Infused with many quotes from Amelia herself, we feel like Amelia herself could have written this book for us. We learn about her best friends, her school life (there’s even a photo of one of her report cards!). We learn how her family visited the World’s Fair in 1905, where her mother wouldn’t allow Amelia to ride the roller coaster, declaring it too dangerous for a young girl. Did that stop her? No! Amelia returned home and built her own coaster in the yard, with wooden boards and baby buggy wheels. Interspersed throughout the stories of Amelia’s childhood years, we hear stories of her last flight, and the strange radio signals received by folks across America, starting with Mabel, a homemaker in Texas, who was listening to an overseas radio program and claims to have heard Amelia’s distress signals over the airwaves. We learn about how Amelia just knew she had to fly; we meet her flying instructor who charged a dollar a minute for the lessons. Amelia was strong-headed and insisted she do things her own way, and in doing so, she made some dangerous mistakes, like not checking her fuel levels. She was also very much into looking the part of the pilot – in fact, after an early plane wreck caused by her own stubbornness, she crawled out the wreckage only to be seen powdering her nose so they could look nice if reporters arrived. By the end of the story, we are on the edge of our seats during the search and rescue, and you are left thinking that somehow she will have been found and is the one telling us her tale. Thrilling, detailed, loads of personal stories from the people who knew her, and plenty of pictures to make us feel like we knew her, too. When I was growing up my schoolroom classes would routinely learn about the great unsolved mysteries of the world. How they made Stonehenge. What really happened to the people of Roanoke? And why did Amelia Earhart disappear? Various biographies made of the woman for kids sort of allude to this question early in the book, forget about it during the middle section, then do a quickie wrap-up of it at the end. Basically, they take one of the most interesting mysteries in history and render it a dul When I was growing up my schoolroom classes would routinely learn about the great unsolved mysteries of the world. How they made Stonehenge. What really happened to the people of Roanoke? And why did Amelia Earhart disappear? Various biographies made of the woman for kids sort of allude to this question early in the book, forget about it during the middle section, then do a quickie wrap-up of it at the end. Basically, they take one of the most interesting mysteries in history and render it a dull dishwater gray. As such, an Amelia Earhart biography would not normally interest me. That is, before author Candace Fleming got her paws on the material. Fleming’s no fool. She knows that if you have a mystery then there is probably a pretty exciting story to tie onto it. Continuity has its charms, but why not chuck the standard bio format if you can get away with it? As such, we get Amelia Lost: The Life and Disappearance of Amelia Earhart. Alternating between the “life” part and the “disappearance” part, kids get sucked into the nail-biting near misses of Amelia’s rescuers between biographical sections where you come to care about the woman herself. And, of course, it’s researched to the hilt. Nice, that. I like research. I like knowing that an author likes research too. It gives me a sense of comfort in this cold and colorless world. The type of research Fleming brings to this book really puts this book ahead of pack, though. You’ve got your basic historic documents, maps, original photographs, etc. That’s fine. Then you have a newly released Coast Guard file on Amelia. That’s interesting. Add into that the documents relating to the folks who thought they heard her on the radio and you might be set. But what I like is that the Bibliography doesn’t just throw all these sources down without a blink, but rather separates them into different categories. So on the one hand you might have “Family members and friends also left behind numerous reminiscences of Earhart” with a list shortly after “In addition to these archival collections, Earhart’s published works were particularly helpful” After that Fleming includes reliable websites relating to Earhart and Source Notes. With all this research I guess I kind of hoped that there’d be a little more speculation in the text itself on what actually happened to her body and her plane. Fleming recounts the rumors from the time period but refuses to go any further, not even mentioning modern speculations. I can see why this choice was made, and Fleming does link to The International Group for Historic Aircraft Recovery (who, as of this review, are planning to conduct an underwater search for Earhart’s plane in July 2012) but it would have been nice to see a little allusion to the general vicinity of the plane's possible last arrival too. I was speaking with someone the other day about failed children’s biographies and what exactly it is they do wrong. She made an excellent case, saying that if you have to ask “Why did you even WRITE this biography?” then the author’s doing something wrong. Earhart being who she was, you wouldn’t necessarily think such a question would arise, but even the most noteworthy individual needs a reason to have a whole book about them. You may be the first [blank] to have [blanked] but what does that mean, really? What does it signify? And why on earth should we have kids read about such a person? Fleming’s talents abound, but what I’ve always liked about her the most is her ability to show both the good and the bad in her subjects. The Great and Only Barnum did a superb job at synthesizing America’s best known humbug into a biographical format suitable for youth. So what makes Amelia noteworthy? Well, some of it is her accomplishments, sure as shooting. But in the end what Fleming manages to do is to balance our affection for the person with her need to advertise herself. Librarian Jennifer Hubert Swan called Amelia “the Lady Gaga of her time“. She curled her straight hair to make it look windblown. She filled her plane with signed stamp covers with the intention of sending the purchased items to folks after she finished her round-the-world flight. In the end, it may well be that the woman had more in common with P.T. Barnum than you might think. Pity those two crazy cats never met one another. You know that early aeronautics would have been right up Barnum's alley. This review has been hidden because it contains spoilers. To view it, click here. "Amelia Lost" is the biography of the great female pilot, Amelia Earhart. She was born and spent much of her childhood in Kansas, although she lived with her grandmother about 50 miles from the rest of her family. However, at the age of 11 Amelia’s family moved to Iowa and continued to move around the country due to her father’s drinking problem. Amelia was a “tomboy” from the very beginning, always breaking traditional female molds. She wore bloomers, jumped fences, played sports, and didn’t l "Amelia Lost" is the biography of the great female pilot, Amelia Earhart. She was born and spent much of her childhood in Kansas, although she lived with her grandmother about 50 miles from the rest of her family. However, at the age of 11 Amelia’s family moved to Iowa and continued to move around the country due to her father’s drinking problem. Amelia was a “tomboy” from the very beginning, always breaking traditional female molds. She wore bloomers, jumped fences, played sports, and didn’t like to be told, “no.” This tendency was reoccurring throughout her life, leading to her desire to go to college and eventually fly airplanes. The ironic thing about Earhart’s flying career was that she wasn’t particularly skilled at flying an airplane. Several of her colleagues and coaches thought she lacked many basic skills, though she never lacked confidence. Much of Earhart’s perceived success came from the publicity she received, thanks to publisher George Putnam. Putnam was the man who essentially made Earhart’s career, helping her to be the first woman to fly across the Atlantic Ocean. Putnam, who eventually married Earhart, kept her in the public eye by scheduling her for lectures, writing books, and be an endorser of products. Earhart continued to fly and break records until she came up with the idea of flying completely around the world; an attempt she failed at. Today, the mystery of Amelia Earhart’s disappearance almost rivals the legacy of her life. The criteria for The Orbis Pictus award is accuracy, organization, design, and style and "Amelia Lost" contains all of these characteristics. For example, the way the book is organized is primarily chronological, but periodically we read a portion about the day Earhart’s plane went missing. This breaks up the potentially slow reading of facts with spurts of suspense and excitement. The book also is a great demonstration of style because it was written almost like a novel, making Earhart seem more relatable than a historical figure in a textbook. Even though I know the outcome of the search for Earhart’s plane, I still found myself on the edge of my seat, hoping the search party would find her. The author portrayed Amelia in a very non-biased way. In other books I had read of Earhart’s flying career, they mostly exalted her. However, author Candace Fleming showed the positive and negative side of the female flyer. We saw her desire to help others, but we also saw her weakness for fame. We experienced her sense of adventure, but we also saw the downfalls of her over-confidence. "Amelia Lost" is a well-rounded novel, portraying Amelia Earhart, her career, and her relationships in an honest and raw way. Earhart’s biography is framed with her dramatic disappearance and the weeks until the search was called off. The author does not begin dryly but with an intense moment in her life that readers are probably the most familiar with and thrillingly expands upon them. The author includes Earhart’s early life and doesn’t shy away from the family’s troubles. From the beginning, Amelia pushed common gender boundaries in her own way and longed for adventure. Growing up Amelia learned to be self-reliant. Earhart’s biography is framed with her dramatic disappearance and the weeks until the search was called off. The author does not begin dryly but with an intense moment in her life that readers are probably the most familiar with and thrillingly expands upon them. The author includes Earhart’s early life and doesn’t shy away from the family’s troubles. From the beginning, Amelia pushed common gender boundaries in her own way and longed for adventure. Growing up Amelia learned to be self-reliant. Fleming details her training and the buildup to a major figure in the public eye through her major undertakings. Fleming makes an interesting point that George Putnam, Amelia’s manager and later husband, helped Earhart cultivate her public image and make a living out of such a dangerous profession which really opens up the celebrity side of her. The themes of this biography include the all important identity and expectations, both societal and gender. The style of author’s writing increases the suspense and tension on the classic mystery. Amelia is characterized in the biography as being both non-conventional and driven role model but also as a being driven in some regards by the fame and fortune. Fleming presents a balance portrait of Amelia Earhart. Overall, I thought the author did a very good job of making this iconic legend a real person by delving into her life and the personality she presented to the world. Major strengths of this biography include keeping maps, primary source documents, photographs of Amelia in action, and further resources if the reader wants to learn more. In respect to the quality of writing, Amelia is fully-fleshed out and well-rounded rather than a mysterious flier. The author is also able to present her in the context of her day and as we see her now. I believe the framing of the biography with what is known of her last flight would be the most appealing aspect of the work to teens because it is able to give the incident a sense of urgency lacking in textbooks. I think the cover would appeal primarily to younger teens. It shows an iconic black and white photo of Earhart posing with one of her planes. The font style, design, and color really set off the picture adding a dash of excitement, danger, and a good deal of adventure. Amelia Earhart is still remembered as one of the greatest female aviators of all time. She was a brave and courageous woman who was very persistent about following her dreams. Amelia was born on July 24, 1897. By twelve weeks of age Amelia already talked to herself in mirrors, and when she was three she was sent off to live with her grandmother. Amelia's grandmother was a big part of her life when she was a young girl. She lived in her grandmother's farmhouse in Kansas. Her grandmother was a very loving and proper person. She loved her grandmother, but she did not care to be proper like her grandmother. George Putnam was another key person in Amelia's life. She met George later in her life, and they were very alike and became quick friends. He was a very smart and nice man with a great sense of humor. After many refusals, Amelia finally said yes to George's marriage proposal. Amelia made friends easily, but had a very different personality from most people. She loved sports and always got her dresses dirty. She also liked building things, which was part of what lead her to airplanes. Amelia excelled at school, but she did not care to make any friends there. Amelia's family lived poorly but Amelia got a new start when she was accepted to a college in California. Not long after that, she started to develop an interest in planes. This would become her great passion in life. At a time when there were few women who dared to fly, Amelia proved her doubters wrong by breaking numerous flight and speed records. Her biggest dream was to be the first woman to successfully fly around the world. Told in alternating chapters about the disappearance and the life of Amelia Earhart, this book keeps the reader interested in all aspects of Earhart's life. 5th through 8th graders will really find this a great book to read, especially if they have a biography reading project. It easily follows the Common Core Standards of reading informational text and analyzing how a key individual is introduced, illustrated, and elaborated in a text. The organization and layout of the text is very helpful. If Told in alternating chapters about the disappearance and the life of Amelia Earhart, this book keeps the reader interested in all aspects of Earhart's life. 5th through 8th graders will really find this a great book to read, especially if they have a biography reading project. It easily follows the Common Core Standards of reading informational text and analyzing how a key individual is introduced, illustrated, and elaborated in a text. The organization and layout of the text is very helpful. If you would like to reading just about her disappearance, one would just have to read the pages that are on gray paper, while the story of her life is on the white pages. I also really enjoyed looking at the the primary source documents that are in this book. Pictures, maps, and journal entries all make this a very educational book. The bibliography, source notes, picture credits, and index will also help many students find the information they are looking for when writing a report or trying to remember certain facts. I found this book fascinating, and a very quick read. I was quickly hooked and when I was reading about her life, I couldn't wait to hear more about her disappearance, and when I was reading about her disappearance, I couldn't wait to read more about her life. I was amazed at how much her husband/publicist got her into the limelight. I also liked how the author never states whether she feels that Amelia Earhart died on that that trip or whether she survived. She really leaves it up to the reader by just presenting the facts about what happened. Seconds turned to minutes. Minutes became an hour. But the sky above Howland Island remained empty. Where, they wondered, was Amelia Earhart?" This excellent biography of America's most famous female aviator, aimed more for a middle school audience, does a great job of outlining not only the major events in Earhart's too-short life, but also the influences that drove her to pursue the skies, and fame. Readers get a strong sense of Earhart's family background, her own keen sense of how to manage her celebrity, and the various myths that have grown up around her exploits. Understanding: In the chapter about Amelia's childhood, Amelia claimed she could see "certain threads...leading me to airplanes." What do you think she meant by that? Applying:Amelia was good at sports, but she wasn't allowed to play on any of the sports teams at school when she was younger because sports were only for boys. What questions would you ask if you were Amelia and you really wanted to play? Who would you ask? Analyzing: What is the relationship between Amelia and Ginger, Toot, and Katch? Evaluating:What is your opinion of these words Amelia once wrote in a letter, "Please know I am quite aware of the hazards. I want to do it because I want to do it. Women must try to do things as men have tried. When they fail, their failure must be a challenge to others."? How do you think this message has impacted other people throughout the years? Interesting history of Amelia Earhart's life. I learned that she lived in DSM for a time and that she worked for Purdue University. The main focus of the book was a record of what she did. I wish there had been more information about the results of ongoing searches for her plane crash, even in the notes at the end. A few years ago, I heard a presentation about theories of where the plane went down. This book just focused on the search for her at that time and did not go beyond the few weeks follo Interesting history of Amelia Earhart's life. I learned that she lived in DSM for a time and that she worked for Purdue University. The main focus of the book was a record of what she did. I wish there had been more information about the results of ongoing searches for her plane crash, even in the notes at the end. A few years ago, I heard a presentation about theories of where the plane went down. This book just focused on the search for her at that time and did not go beyond the few weeks following when she was last heard from. While it reported the different accounts of people who thought they heard her broadcast calls for help, there was no attempt at explaining the significance of them. The legend of Amelia Earhart seems to grow more and more mysterious with each passing year, and with it the true woman Amelia Earhart was gets lost in translation. In Amelia Lost Candace Fleming examines who the real Amelia Earhart was, and how she came to be seen as one of the most influential, and interesting, women in the past century. Beginning with her childhood and ending with her mysterious disappearance the reader gets a up-close and personal look at the women named Amelia Earhart. The st The legend of Amelia Earhart seems to grow more and more mysterious with each passing year, and with it the true woman Amelia Earhart was gets lost in translation. In Amelia Lost Candace Fleming examines who the real Amelia Earhart was, and how she came to be seen as one of the most influential, and interesting, women in the past century. Beginning with her childhood and ending with her mysterious disappearance the reader gets a up-close and personal look at the women named Amelia Earhart. This is a 2012 NCTE Orbis Pictus Award for Outstanding Nonfiction for Children Honor book. It's the life of Amelia Earhart - her trials and triumphs. She fought for women's rights and believed anything a man can do so can a woman. The story of her life is quite interesting, but I believe the book to drag on a bit, especially for young children. It's a gender neutral book, but definitely more for older students, 5th grade and up. Ebook - Champion: The Story of Muhammad Ali by Jim Haskins. (2 star This is a 2012 NCTE Orbis Pictus Award for Outstanding Nonfiction for Children Honor book. It's the life of Amelia Earhart - her trials and triumphs. She fought for women's rights and believed anything a man can do so can a woman. The story of her life is quite interesting, but I believe the book to drag on a bit, especially for young children. It's a gender neutral book, but definitely more for older students, 5th grade and up. Maybe I just haven't found them, but I wish there were more non-fiction books like this one out there for middle grade readers. Fleming tells the story of Earhart in a way that's mature but not intimidating; there are plenty of pictures and lots of information in this slim book. Jumping back and forth between her biography and snap shots of the hours and days spent trying to find her adds a nice bit of tension. Kids reading confidently at around a 6th or 7th grade level shouldn't have any troubl Maybe I just haven't found them, but I wish there were more non-fiction books like this one out there for middle grade readers. Fleming tells the story of Earhart in a way that's mature but not intimidating; there are plenty of pictures and lots of information in this slim book. Jumping back and forth between her biography and snap shots of the hours and days spent trying to find her adds a nice bit of tension. Kids reading confidently at around a 6th or 7th grade level shouldn't have any trouble with the text. I read anything I could find about Amelia Earhart when I was a child, but the biographies designed for children were understandably sanitized. This is an easy-to-read though meant-for-adults book that offers a far less sanitized biography as well as more information about the search for her and her missing plane. It also explains some of the reason why she became so famous and then legendary: Beyond her disappearance, which undoubtedly made her a legend, she and (later) her husband had cultivated I read anything I could find about Amelia Earhart when I was a child, but the biographies designed for children were understandably sanitized. 1.Remembering-Name at least three cities that Amelia lived in while growing up. 2.Understanding-Why did Amelia have to have a male copilot on her first trans-Atlantic flight? 3.Applying-How did Amelia change the way women looked at their future prospects. 4.Analyzing-Why do you think Amelia's round the world tour failed? 5.Evaluating-If someone you loved wanted to do something very dangerous like this, would you support them like her husband George Putnam supported her? This book is a biography about the famous Amelia Earhart. It tells of her life, her young years until her death .This book has great add- ons, such as small articles about a topic that is shown in the book. It has many quotes, and opinions of people about Amelia. This book shows secrets that Amelia kept, such as that her hair isn’t naturally curly or that the first plane she saw, was at a fairground. I would recommend this book to those who are fans of Amelia or who are searching for clues abou This book is a biography about the famous Amelia Earhart. It tells of her life, her young years until her death .This book has great add- ons, such as small articles about a topic that is shown in the book. It has many quotes, and opinions of people about Amelia. This book shows secrets that Amelia kept, such as that her hair isn’t naturally curly or that the first plane she saw, was at a fairground. I would recommend this book to those who are fans of Amelia or who are searching for clues about her life. Its a 5 star, because, the author keeps the reader close to the book. Remembering: State an event that led to Amelia's love of airplanes. Understanding: Describe what is meant by the title of the chapter "Fame". Applying: What questions would you ask if Amelia survived the wreckage? Analyzing: What is the relationship between Amelia and George? Evaluating: What choice would you have made if you were in Itasca's situation? Candace Fleming moves readers back and forth between Amelia's life (from childhood up until her last flight) and the search for her and her missing plane. This story is awesome because it has great photos, maps, and handwritten notes from Amelia herself—plus informative sidebars explaining everything from the history of flight to what Amelia liked to eat while flying (tomato soup) this biography would be great for middle school. I would probably present it in a small group book club. Audience:Ages 8-11, anyone interested Amelia Earhart, history and biography lovers, airplane enthusiast, girls interested in historical women's figures. Appeal:Packs in a lot of information but organized not to overwhelm. Clear, crisp pictures, well organized information, good bibliography for additional research as well as picture credits! Another wonderful biography from Ms. Fleming, who always manages to bring her subjects vividly to life. I particularly appreciated the preface in which she discusses the challenges of sorting out facts from a life that has become so shrouded in myth, especially when Amelia Earhart herself played a big role in the myth-making.